Place it in a box wrapped in aluminum paper. Deposit the box in an easy to find location in the daycare. We suggests an imaginary game for your group. (Open thematic letter - Robots) Print the letter. Place it in a box wrapped in aluminum paper. Deposit the box in an easy to find location in the daycare. Have children find it and read portions of the letter to them each day. Wrap as many things as possible with aluminum paper. The pictures may be used as a memory game or to spark a conversation with the group. Use them to decorate the daycare or a specific thematic corner. 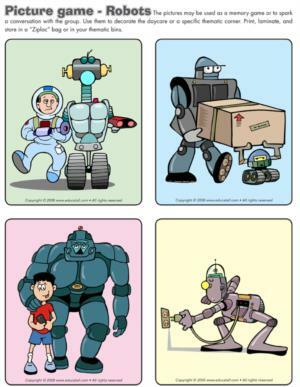 (Open picture game - Robots) Print, laminate, and store in a "Ziploc" bag or in your thematic bins. Wacky costumes can be used to create space creatures, remember to take pictures! Large cardboard boxes are perfect for creating robot costumes. Bubble wrap, an old snowsuit, or simply transparent garbage bags are fun too! An old computer keyboard, old pots, a colander, etc. Children will get creative and fantastic robots will emerge! (Open picture clue story - Robots) Print. Sit in a circle with the group. Begin reading the picture clue story. Pause for each picture clue. Point to the clue and have children guess the missing word. Complete the activity with a craft and discuss the story. This game is played like "Simon says". Give children instructions. They must follow the instruction only if you said "The robot says..." first. Otherwise, they must remain still. Have children build a robot using Lego blocks. Each child can build his own robot or they may work together. 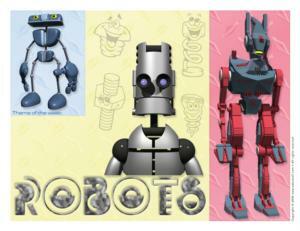 (Open game - Giant robot pieces) Print, laminate, and cut each robot piece. Children sit on the floor to assemble their giant robot. (Open coded message) Print. Robots have a language of their own which we do not understand. Have children invent or interpret the meaning of the messages. Children find a partner. Deposit various objects on the table (pencil, small car, block, etc.). One child sits at the table, blindfolded. The other child stands beside him. The blindfolded child must listen carefully to his partner's instructions. For example, he may instruct him to move his hand higher, lower, to the left, or to the right, to find an object. Two children stand, facing each other. They must try to repeat each other's movements as if they were their friend's reflection in a mirror. Invite them to move like robots. Robots are made of metal and magnets stick to them. 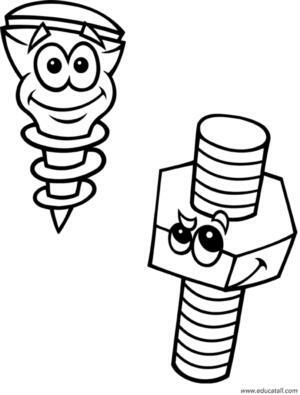 Provide children with magnets and encourage them to find metal objects within the daycare. Place objects on a table (nails, paperclips, coins, elastics, aluminum, pencils, blocks, lipstick, etc.). Place a magnet near one object at a time. Sort the objects. The objects attracted by the magnet go in one container and the objects which are not attracted to the magnet go in another container. Help children understand how metals are attracted by the magnet. 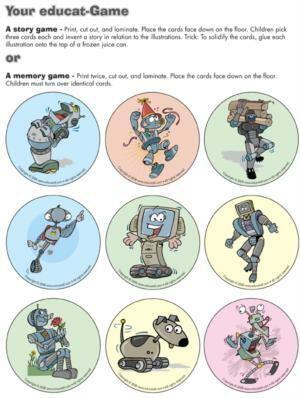 (Open story and memory game - Robots) Print twice and cut out the illustrations. Glue them to the top of frozen juice cans. Attach a magnet to the end of a fishing rod (or a stick with string). Lay the illustrations face down on the floor. Children pick two illustrations. If they are identical, they keep them and play again. Otherwise, they must wait for their next turn. Prepare chicken broth. Add noodles shaped like tiny springs. Have children drink the soup using straws and eat their "springs" with their fingers. Give each child a brown paper grocery bag. Draw eyes, a nose, and a mouth. Cut them out. Provide several metal cans, empty toilet paper rolls, aluminum paper, and a variety of material children may use to create their robot. Help them secure their pieces with hot glue. For each child, cut a hole in the top of a box for his head. Remember to cut out a nose, eyes, and a mouth. Cover with aluminum paper. Add antennas made with pipe cleaners and Styrofoam balls. Let children decorate as they please. Have children create a collage using fusilli pasta and corn syrup. Let children paint with a corn syrup and maple syrup. You may add food colouring to make the "paint" darker. 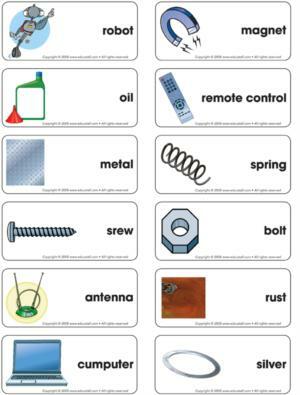 (Open robot antennas) Print for each child. Cover a headband and the antennas with aluminum paper. Staple and decorate. 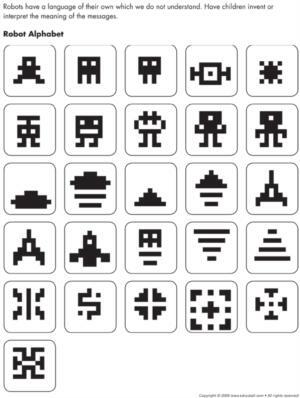 (Open creative coloring - Robots) Print for each child. Children complete the picture by drawing what is hidden in the robot's stomach.